Many would call Tehran a mere concrete jungle, choking in a cloud of smog, but while the capital city is so much more and definitely worth a stop, there is a reason why Esfahan remains Iran’s national treasure. In their delightful sing-song accents, locals will tell you, “Esfahan nesf-e jahân” – Esfahan is half the world – and after visiting, it may not seem like such an exaggeration. The sites are endless and the architecture a dream, making a strong case for visiting Esfahan before Tehran. Among the architectural masterpieces to behold in Esfahan are the bridges – a grand total of 11, in fact. However, most visitors satisfy their design-lust after visiting just two: the longest, Si-o-se Pol (Bridge of 33 Arches), and the most stunning, Pol-e Khâju. Those taking an evening stroll are sure to be graced by the voices of locals reciting poetry that echo throughout the archways. If you’re lucky enough to visit when the Zâyandeh River is full (it’s heartbreakingly dry for most of the year), you’ll be dually rewarded with the calming sound of babbling water, recreating one of the 1,001 Nights unmatched by any other city. The Imam Mosque is revered for its Islamic calligraphy, perfectly symmetrical arcades, and lofty, tiled domes, each with a unique design. The acoustic properties inside this mosque pique tourists’ curiosity and are a particular point of interest. On the eastern side of Meidan Emam stands Sheikh Lotfollah Mosque, with its imposing, off-center dome. The cream-colored tiles are a shift from Esfahan’s signature blue, and take on a pinkish hue around sunset. Between the countless domes of Imam Mosque, Sheikh Lotfollah Mosque, Jāme’ Mosque, and Vank Cathedral and the ceilings of Chehel Sotoun, Ali Qapu, and Hasht Behesht, fewer places will have you constantly craning your neck to look up than Esfahan. In fact, tourists, tired of doing just that, are commonly seen lying down on the ground to contemplate the kaleidoscope of colors and patterns above. Meidan Emam, one of the first sites in Iran to be listed as a UNESCO World Heritage Centre in 1979, was built by Shah Abbas in the 17th century. Travelers can easily spend an entire day here marveling at the architectural feats on each side of this square and haggling with business-savvy bazaar stallholders in the two-tiered arcades connecting the monuments. Elsewhere, Chehel Sotoun (“40 pillars”), with its 20 wooden columns that double in number in the reflecting pool, is adorned with frescos depicting battle scenes and royal banquets. This Safavid-era pavilion is nestled in a well-manicured green space, adding it under the umbrella of UNESCO’s Persian gardens. 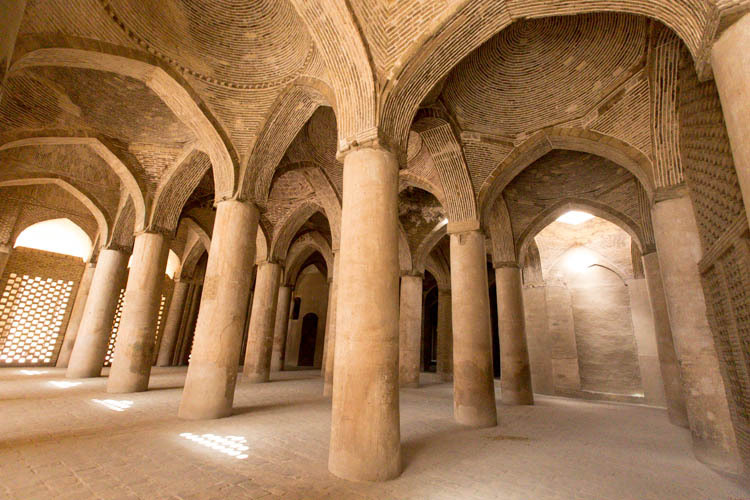 Finally, Jāme’ Mosque, listed in 2012 and one of the oldest mosques in Iran, is praised for its two brick domes and detailed calligraphy. Esfahan is known for a handful of local specialties not found anywhere else. First and foremost is the city’s pride and joy: beryouni, minced mutton and lungs, cooked in a small pan with a dash of cinnamon and spices, and served with almond slivers over flatbread. The other, sweet and usually eaten as a side dish or dessert, is a bit deceiving. Khoresht-e mâst (yogurt stew) has a pudding-like consistency and is made with yogurt, lamb or chicken, saffron, sugar, and orange zest. Gaz (Persian nougat) and poulaki (coin-shaped caramels) are the typical sweets of the city. A city concerned with aesthetic beauty, Esfahan is, naturally, the home of the finest handicrafts. Ghalamkâr is a traditional textile printing using wooden stamps. Usually made of pear wood, these stamps come in hundreds of patterns, including floral, geometric, arabesque, and pre-Islamic. The Persian art of marquetry, khâtamkâri involves decorating surfaces with fine pieces of wood, bone, and metal. Minâkâri, or enameling metal and tiles with glaze, is named after the Persian word for heaven and refers to its azure color. These items make great souvenirs, and your time spent in this majestic city will become clear to anyone who sees them. Aside from being able to find everything you need, the Grand Bazaar of Esfahan is alive with energy. Starting at the main entrance at Qeysarieh Portal in Meidan Emam, the labyrinth of mazes takes you through madrasas (educational institutions), caravanserais (inns), and centers of trade. The oldest parts are over 1,000 years old, and as you wind your way in deeper toward the steady banging sounds, metal workers will come into view. Ghalamzani (engraving metal) is an art brought to life in Esfahan. Elsewhere, artists are busy laying pieces of khâtamkâri (marquetry) and painting miniatures with a single-haired brush.